Velvet jacket, from Massimo Dutti; embroidered lehnga, from Mogra; gold earrings, necklace, both from Tribe Amrapali. Hair and make-up by Elton J Fernandez. Location courtesy: Rivers to Oceans, Palladium, Level 1. At the onset of the millennium, she became the face to reckon with when she cruised through the Miss India contest and thereafter the Miss Asia-Pacific pageant — bringing home the title after almost three decades. 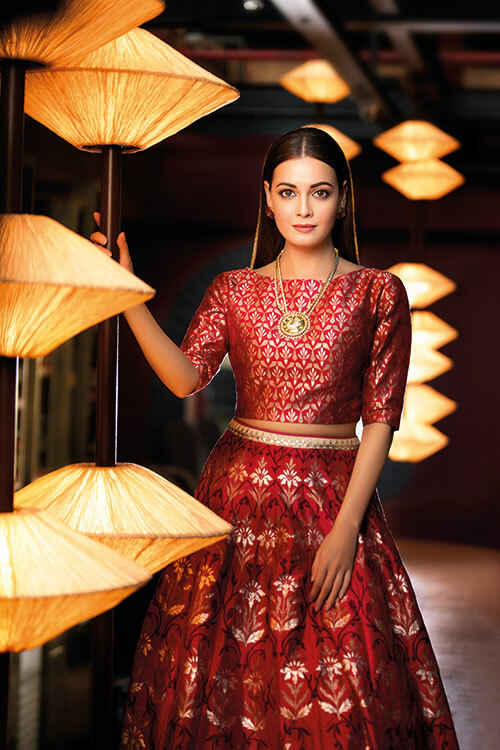 Dia Mirza’s subsequent career choices earned her a spot in everyone’s hearts. From playing Reena Malhotra in her debut film Rehnaa Hai Terre Dil Mein (2001), to her portrayal of Maanayata Dutt in the biopic Sanju earlier this year, Mirza’s silver-screen outings have been infused with a natural and delightful charm. For her date with Verve at Palladium she drives in with exemplary promptness. 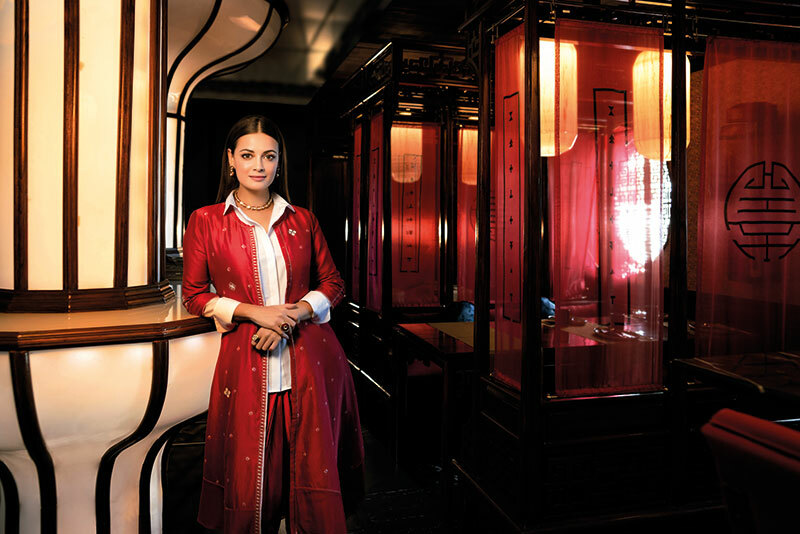 Stepping into the vanity van, she sets into motion a series of synchronised actions which result in stunning frames in the plush locales. Dressed in festive drapes and hues, Mirza looks the camera in the eye with a confidence that is evident on the monitor where we are tracking her movements and the moments. And a few hours later, when the lights, cameras and action break for a quick cup of Joe, I take it as my cue to catch up with the actor, producer, director and humanitarian. To me, Mirza has always been the artiste who carries herself with the utmost grace and panache. And for as long as I can remember, I also recall Mirza being an active and passionate advocate for green living. In a candid chat with Verve — one that touches upon her environmentally conscious efforts, what science, technology and social media are doing for the world, her recent screen outings and how she defines true beauty — we discover what makes Mirza a seamless confluence of glamour and philanthropy. Brocade top, lehnga, both from Anita Dongre; white polki earrings with rubies, kundan polki necklace, both from Zoya. Hair by Sheetal F Khan. Make-up by Pallavi Symons. Location courtesy: Foo, Festival Square, Level 1. White shirt, from Massimo Dutti; red jacket, from AM:PM; dhoti pants, from Mogra; kundan polki earrings, necklace, rings, all from Zoya. Hair and make-up by Elton J Fernandez. Location courtesy: Typhoon Shelter, North Skyzone, Level 1. Printed slip, appliqué embroidered jacket, velvet dhoti pants, all from Ritu Kumar; velvet embroidered mules, from Gossip; gold earrings, beaded necklaces, cuff, all from Tribe Amrapali.